My name is Rupesh Gurudas Halarnakar and I am raising funds for my Audio CD Album "Natya Sandhya (Notations Sobat Natyageet)". The album is based on famous Marathi Natyageet from various popular Marathi Sangeet Naatak (Drama) with Notations for young artist and students to learn Natya Sangeet. The album will consists of 9 songs from popular Marathi Naatak like Sangeet. Sanshaykallol, Sangeet. Mandarmala, Sangeet. Matsyagandha, Sangeet. Yayati Aani Devyani, Sangeet. Saubhadra, Sangeet. Sanyastkhadg, Sangeet. Katyar Kaaljat Ghusali and Sangeet. Maanapmaan. The album will cost Rs.300000/- approximately. We would used this fund to distribute the album in Goa, Maharashtra and parts of Karnataka. 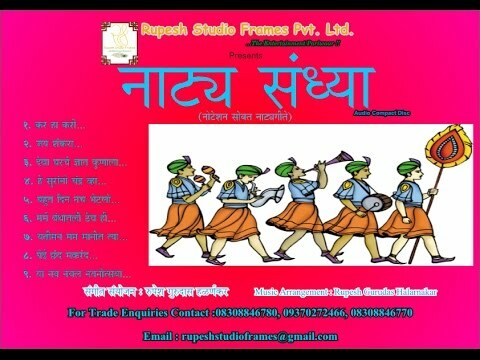 After the success of films based on Hit Sangeet Marathi Naatak like Katyar Kaaljat Ghusali, people including youngsters are now turning towards learning classical and semi classical music. Since we aim to promote our music to the world, our album will help such talent to learn music from home apart from going to any classes and help in our endeavor. We have so far successfully released 3 albums in Marathi named Chiranjivi Ho (A play based on social issue), U R My Love-1 (Love song Album) and Bhakti Dhara 1 (Devotional Album). We not only have experience in doing and promoting albums but we also have done short films like Ling Bhed and I Am Indian apart from Web Series YouTube and a serial on Regional Doordarshan Channel. Your share could be as good as a donation for Rupesh Studio Frames! Not everyone can afford to take care of their loved ones. Rupesh Studio Frames's life can only be saved by donations made by kind people like you.